On the 10th anniversary of the fleet's exodus from the Colonies, a reunion is in the offing. The story opens with Apollo making an emergency report to the Galactica from his Viper. His wingmen have both been killed in a Cylon ambush, then his Viper is struck and the Galactica loses contact as we see his flaming fighter plow down into what looks like a dead moon. Three days earlier, Commander Adama delivers a speech to the fleet on the 10th anniversary of the fleet's exodus from the Colonies. He remarks that they have not had contact with the Cylon menace for over two yahrens, but must remain vigilant and promises that they will endure until they finally locate the lost thirteenth colony called Earth. After the speech, Adama calls for a meeting of the section leaders, but Starbuck has to drop out as he receives an urgent call to meet Dr. Salik in the life center. In the meeting, Athena pushes to start using some non-conventional methods in their search for Earth, such as psionic divination. The senior members shoot her down rather rudely. In the life center, Xam, the deck chief who gained psionic abilities but fell into a coma after using them (in "Dreams of the Thirteenth" Part 3) has been comatose for the past seven yahrens, but has suddenly been able to type out a single message on a touchpad, "TAURELLA 441: 334: 112: 198". The Taurella was a ship of the fugitive fleet that fell behind and was lost during the first yahren of the voyage. Adama sends a Viper flight to check out the coordinates provided and the Taurella is found, led by the psionic Countess Sephoni of Scorpion. She sent the psychic message of their present coordinates in hopes of being reunited with the fleet. She then reveals she has divined the location of Earth. This story takes place ten yahrens after the fleet's escape from the Twelve Colonies, about two years after the events of the last recorded adventure in the chronology, "A Destiny Among the Stars" in the Colonial yahren 7350, making it now the yahren 7352. The story also indicates the events of "Dreams of the Thirteenth" Part 3 took place seven yahrens ago. Throughout this mini-series, the nickname/abbreviation "'Buck" is used by many characters when addressing Starbuck. Boomer referred to him as Buck a couple of times in "Beautiful Mirage". Some of the artist's depictions of Vipers seem to be of the BSG2000 Mark II model instead of the traditional Viper seen in BSG70. This happens a few times throughout the mini-series. 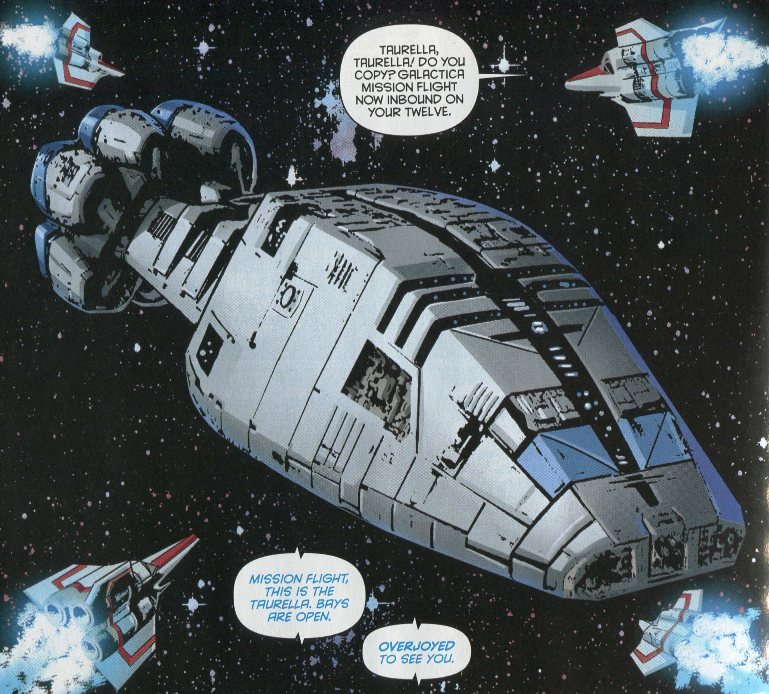 On page 1, Apollo reports the loss of both of his wingmen, Zurel and Neats, to a Cylon ambush. Zurel and Neats have not previously appeared in any other BSG stories. Page 2 reveals that Apollo is now a major at this time. On page 3, a number of familiar ships of the fleet are seen following the Galactica through space. A previously unseen ship with a ring around its central cylinder is borrowed from the BSG2000 fleet ship, Zephyr, used for rest and relaxation by members of the fleet. Whether this similar-looking ship serves the same purpose here is unknown. Two similar ships are seen in the distance in "The Death of Apollo" Part 6 (page 21, panel 1). Commander Adama sports a full beard here, as opposed to the Van Dyke style he had in Dynamite Entertainment's previous BSG series beginning with "Memorial". As usual (outside of the TV episodes), and incorrectly, Apollo is depicted with his laser gun on his right hip instead of his left. In his speech to the fleet on the tenth anniversary of their escape from the Colonies, Adama remarks that it has been over two yahrens since their last contact with the Cylon menace. We might interpret this as a reference to the events on the planet Arilos in "A Destiny Among the Stars" in Colonial yahren 7350. On page 4, Boxey refers to Cylons as "clankies". We see here that Boxey still has Muffit as a pet. Page 7 reveals that arthritis plagues Adama. Page 8 reveals that Starbuck is now a captain. Page 9 reveals that Athena is a captain as well; however, she was a Lt. Colonel in "A Destiny Among the Stars". For continuity's sake, we might assume her rank in this mini-series to be the same. Page 10 reveals that Starbuck has been visiting Xam's medical chamber in the life center every day for the last seven yahrens, ever since Xam's latent psychic ability was triggered and he stopped the Cylons and fell into a coma in "Dreams of the Thirteenth" Part 3. Doctor Madusa finds that Xam is finally starting to show signs of activity. Doctor Madusa last appeared in "The Adama Gambit" Part 2. On page 13, Dr. Madusa tells Starbuck that Xam has been unconsciously typing out "TAURELLA 441: 334: 112: 198" on a touchpad placed under his hand for the past two centars. A centar is a Colonial unit of time measurement similar to one Earth hour. The keypad on the touchscreen used by Xam is a fairly standard QWERTY keyboard. On page 13, there is even a .com button visible, similar to the keypads found on Kindle devices! Athena's suggestion of using psionic divination as part of the fleet's attempts to locate Earth is rudely shot down in the senior briefing by Colonel Tigh, Omega, and even her father, Adama himself! But it seems odd that Adama would oppose the idea; he has shown receptivity to psychic abilities in the past, even demonstrating them to a limited degree in "War of the Gods" Part 2. On page 19, Adama implies that Athena will be commander of the Galactica before Apollo, leaving Apollo to do what he excels at, piloting a Viper. This issues reunites the fleet with a ship, the Taurella, that fell behind and was lost in the first yahren of the exodus. This is the first mention of the ship. 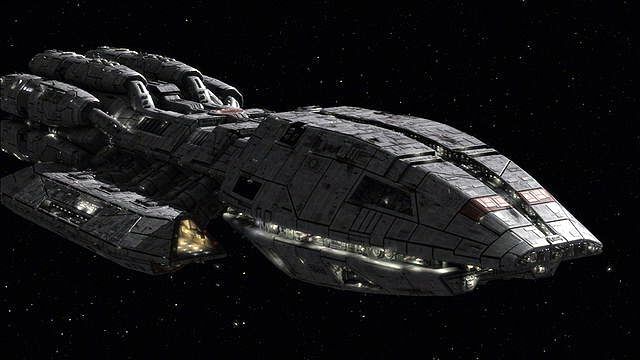 It has rather a look of some of the BSG2000 ships, most particularly the Pegasus. With the return of the Taurella, the fleet is up to 211 ships from the last known 210 in "The Fever".